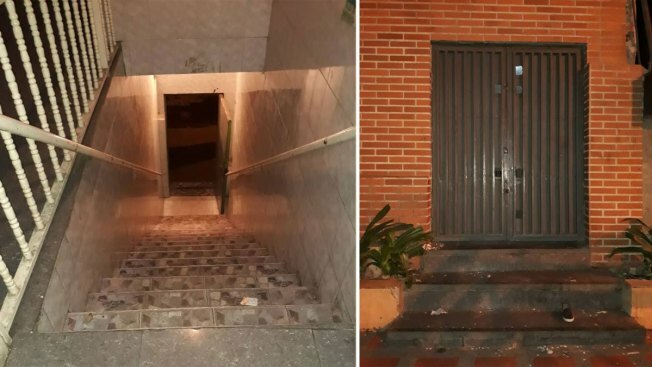 A fight broke out at this nightclub in Venezuela early Saturday, government officials said. A tear gas device was set off and there was a stampede of more than 500 people, leaving at least 17 people dead. Seventeen people were killed at a crowded nightclub in Venezuela's capital Saturday after a tear gas device exploded during a brawl and triggered a desperate stampede among hundreds gathered for a graduation celebration, government officials said. Interior Minister Nestor Reverol said the incident at the "Los Cotorros" club in the middle-class neighborhood of El Paraiso left eight minors dead and five injured. Eight people were detained, including two teens believed responsible for setting off the tear gas canister. "The establishment has been ordered closed, and we are investigating in coordination with the public ministry, which is directing the criminal investigation," he said. Family members wept and embraced one another after identifying the remains of their loved ones at a nearby hospital. Outside the club, several mismatched shoes, including a sandal with a puckered red lip decoration, lay on the sidewalk. "All I know is my son is dead," Nilson Guerra, 43, told local journalists. More than 500 people were believed to be inside the club when the fight broke out. Julio Cesar Perdomo said his injured son told him the tear gas was launched from inside a bathroom and that partygoers tried to flee but found the club's door closed. Pictures posted by Reverol on Twitter show a narrow tiled staircase leading to a metal door. "The kids couldn't leave," Perdomo said. Officials did not provide any information to confirm or deny Perdomo's account. The club is officially called "El Paraiso" or "Paradise" but is more widely known as "Los Cotorros" or "The Chatterboxes." Photos shared online from previous celebrations at the club show a dark interior with wooden tables and a stage upfront where DJs shuffled songs. Green painted metal bars and gates covered the doors and windows. Outside, a faded sign on the red brick building read "We've opened!" Jesus Armas, an opposition councilman who lives in the neighborhood, said the Interior Ministry should explain how a civilian was able to obtain tear gas canisters that should only be utilized by state security forces. He also urged authorities to investigate whether the club had permission to hold several hundred people inside. "That's not a big space and that should not be authorized," he said. He added that other violent incidents had taken place inside the club, which is frequently used by the Ecuadorean community for parties and political events. Several campaign signs for Ecuadorean politicians were hung outside the building. Police have detained the owner of the club for "not guaranteeing adequate supervision and preventing the entry of any type of weapon." No information on the owner's name, exact charges or current whereabouts was immediately provided. Caracas is one of the most violent capitals in the world and the country is engulfed in a deepening economic crisis that has forced hundreds of thousands to flee. The Venezuelan Observatory of Violence estimates about 26,600 people were killed in 2017. InSight Crime, a group that studies organized crime in Latin America, characterized Venezuela as the "most homicidal country in the region" with a rate of 89 violent deaths per 100,000 residents. Haide Berrio, the aunt of a 17-year-old boy killed in the melee, told local media she went running out to find her nephew in the middle of the night after hearing about the commotion and knowing that he was attending the party. Relatives of the boy found him among the dead and said he was killed by asphyxia. Her eyes sunken in grief, she said all the family wants now is for the club to be permanently closed and the owner held responsible. "I am asking for justice," she said.